157 Papal States - 1950 / 99, very nice mint never hinged collection, in the number of a major listing complete in four Lindner T hingeless printed form ring binder with all appeared souvenir sheets, special- and commemorative sets, Gratianus airmail 1951 and so on. A very nice and Cultivated quality object! 350 x Papal States - extensive lot packed in a carton, as well covers and First Day Cover, cards, as well mint never hinged issues, lovely motives and so on. 430 x Papal States - extensive lot packed in a carton, with also yearbooks, numerous nice illustrated First Day Cover, numerous mint never hinged issues, with also nice motives, souvenir sheets and so on. Very favorable! 463 / Jan 15 Papal States - 1929 / 78, rich collection in a large stockbook with a lot of better issues, as well the beginning years represented strongly including Michel no. 1 / 15, lawyers Congress 1934, Catholic press, archaeologists Congress, Gratianus airmail, souvenir sheet 1 with numerous further issues. Favorable! 489 Papal States -1959 / 93, complete mint never hinged collection, clean in the Schaubek hingeless illustrated album with all appeared stamps including souvenir sheets. Favorable! 520 ⊙ Papal States - 1963 / 2010, very nice used collection, except for very few insignificant values complete in three Lindner ring binder with special- and commemorative sets, many complete volumes, souvenir sheets and so on. A very nice and Cultivated object! 557 Papal States - 1929 / 85, very nice mint never hinged collection with plenty of better issues, as well postage stamps set 1929, holy year 1933, postal stamps 1933, lawyers Congress 1935 expertized Diena, Catholic press 1936 expertized Diena, archaeologist congress 1938 expertized Diena, postal stamps 1949, Universal Postal Union 1949, souvenir sheet 1 and numerous further special- and commemorative issues, many complete sets and so on. A very nice object! 709 ⊙ Papal States - 1961 / 93, extensive used collection, nearly complete in two Lindner T hingeless printed form ring binder with numerous complete sets, volumes and so on. Original price the albums already approximate 230,- €. 741 Papal States - 1970 / 96, very nice mint never hinged collection, nearly complete in the Borek hingeless printed form ring binder with many complete volumes, beautiful subjects and so on. Superb collection! 1072 ⊙/ / Papal States - 1852 / 1984, collection in the KABE illustrated album, beginning with issues Papal State, also better values, then Papal States with early sets, lawyers Congress 1935, issues of the forties and fifties as well the years 1954 / 84 almost complete. Favorable! 1168 Papal States - 1933 / 2011, very nice and cultivated mint never hinged collection, nearly complete in four hingeless printed form albums including numerous better issues, sought-after sets, souvenir sheets, many beautiful subjects and so on. With also lawyers Congress 1935, Catholic press 1936, Gratianus airmail 1951, a hundred years stamps souvenir sheet 1952, a very nice part novelties and so on. A wonderful quality object with very high catalogue value! 1191 /⊙ Papal States - 1970 / 88, collection mint never hinged and once again used always complete in two Lindner album pages. High subscription price! 1467 /⊙/ Papal States - extensive lot in a large stockbook formed, with numerous older issues from 1929, special- and commemorative sets, lawyers Congress 1934 twice and so on. Enormous catalog value! 1548 /⊙/ Papal States - 1929 / 85, extensive lot in a large thick stockbook with lots of material from the beginning years, as well numerous special- and commemorative sets, souvenir sheets and so on. Very high catalog value! 1628 ⊙ Papal States - 1929 / 62, very nice used collection the early issues, in the number of a major listing complete, clean and maintained in the Lindner T hingeless printed form ring binder. Also the scarce provisional series neat cancelled in perfect quality with photo certificate Raybaudi, lawyers Congress, all special- and commemorative sets, postal stamps, souvenir sheet 1, Tobias airmail set, Gratianus airmail 1951 with photo certificate Raybaudi and so on. An especially nice and Cultivated quality object! 2183 Papal States - 1983 / 2005, complete collection the officially yearbooks with the mint never hinged issues, postal stationery and so on, very fine illustrates and explains. In total 23 various examples with enormous acquisition price packed in a carton. Favorable opportunity! 2195 Papal States - 1929 / 2004, very nice and cultivated mint never hinged collection in three Lindner T hingeless printed form ring binder. As well better issues as for instance archaeologists Congress 1938, 75 years Universal Postal Union 1949, Gratianus airmail 1951 with photo certificate Raybaudi, a hundred years stamps souvenir sheet 1952 and so on. The years 1949 / 2004 are complete available. A wonderful quality object! 2452 Papal States - 1983 / 2001, complete collection the officially yearbooks Uno 1996, in total well, 18 various examples with the mint never hinged issues, postal stationery and so on. Huge subscription price! 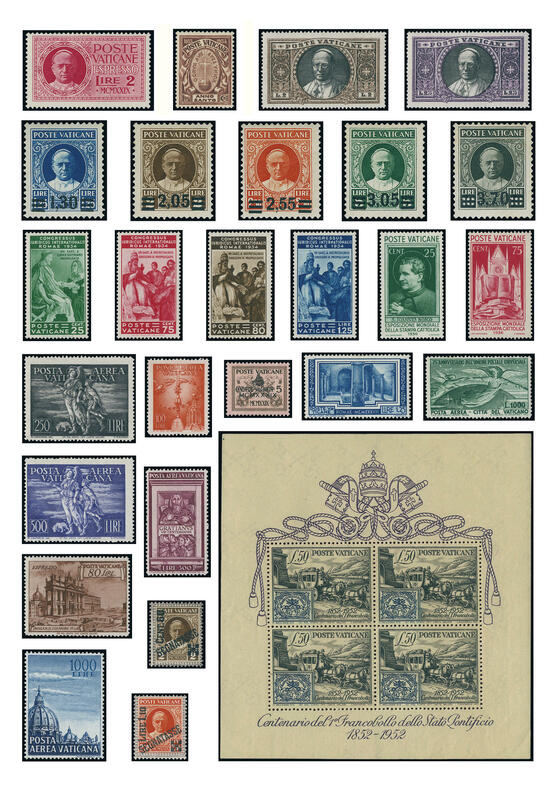 2514 /⊙/ Papal States - 1929 / 2000, extensive inventory in four large stock books accommodated, predominantly mint never hinged, with lots of material, numerous special- and commemorative sets, also the provisional series complete and much further material. Very high catalog value! 2567 / Papal States - 1929 / 94, nice collection in the lighthouse hingeless illustrated album, complete with all issued stamps, predominantly in mint never hinged condition. And, of course, all expensive issues, postage stamps set 1929, package stamps 1931, provisional set 1934 expertized Alberto Diena, lawyers Congress 1935, Catholic press 1936, archaeologists Congress 1938, Tobias airmail 1948, Universal Postal Union 1949, Gratianus 1951 and so on. A very nice object!